The new 27-inch Out & Back Max mud tires are now available from STI Tire & Wheel. 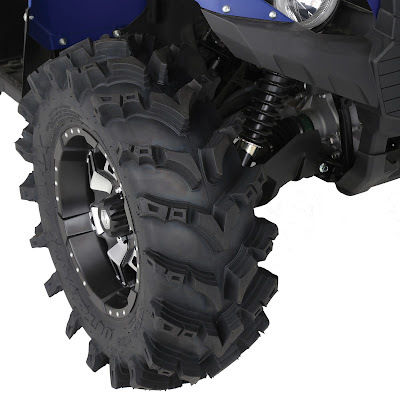 Built for 14-inch wheels, these proven performers were designed for today’s smaller UTVs and full-size ATVs, delivering reliable mud performance without the need for expensive machine modifications to gain tire clearance. Like all Out & Back Max tires, the new 27 x 10-14 size features 8-ply rated construction with deep lugs shaped to move mud. That rugged carcass allows low-psi operation, superior flotation, and unmatched durability. The Max’s aggressive tread pattern features center lugs measuring 1.5 inches deep, with 2.0-inch deep lugs at the shoulders. These lugs are built with a stepped-base construction that minimizes flex across the tread, maximizing traction and tire strength. Well-placed dimples in the lugs increase traction-grabbing surfaces. The new 27-inch tires carry a suggested retail price of $182.46, and complement the complete line of STI Tire & Wheel Out & Back Max, plus HT, AT, XT and XLT tires, a multi-size lineup of all-conditions tires currently available in sizes 23-inch up to 36-inch for a broad range of machines.